I DIDN’T TRULY UNDERSTAND THE MYSTERIOUS, OMINOUS ROLE OF THE DRAMATURG UNTIL I’D BEEN WRITING ‘PROFESSIONALLY’ FOR ABOUT FOUR YEARS AND HAD WORKED WITH FOUR OR FIVE DIFFERENT DRAMATURGS WHO HAD ALL BROUGHT ME DIFFERENT LESSONS ABOUT DRAMATIC CONVENTIONS. With no formal training I was learning on the job, what worked and what didn’t. I seemed to have an infatuation with what didn’t, dragging my painfully over-worded, prose-filled, two-hander about a delusional heroin-addict Shrunken Iris around the country to various conferences and festivals like it was some sort of get-out-of-jail-free card or free-trip-to-wherever-the-next-conference-is card. Where was the journey, the humour, the tension, the arc, the payoff? At the time I couldn’t understand why he hadn’t said something to save me this humiliation, and I muttered to him, “I don’t think I can do this,” at which he laughed and reassured me, “Of course you can. It’s all there, it’s in the characters.” And so it was—in their backstories that I had written half-heartedly, not really understanding the point of the exercise. A map of their lives, the arc, the suspense, the tension, the journey and ultimately the real story of Hep C was all there waiting to be found and written. John, skilled dramaturg that he is, knew that he couldn’t show me, that I had to discover it for myself—then his job could really begin. To me a good dramaturgical relationship has nothing to do with race or gender. I have worked with both men and women, Indigenous and non-Indigenous—maybe because I don’t write race- or gender-specific stories. I write stories that just happen to be about Aboriginal people. To achieve success it is essential for a dramaturg to be able to keep pushing past the point of what the writer thinks is possible, convincing them that it can be taken further, made better, that there is more truth to be found, revelations to be made, that there are more laugh-out loud and punch-em-in-the-guts moments, that not every word is precious nor every line needed, that the loudest moments are found in the silence, and though the ending may have been written the story is far from over. 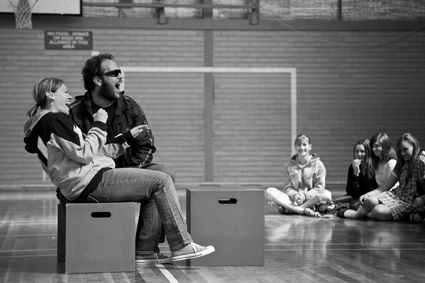 A non-Indigenous dramaturg must not be scared to ask questions that may seem ignorant, to make points that are not politically correct, to sometimes play the racist advocate but ultimately have an empathy and understanding of the diversity of the voices of Aboriginal people—recognising we are not all the same, that we all look, feel, think, desire, live, experience, express and write differently and yet somehow simultaneously share a commonality that belongs to all of us. A good dramaturg also knows that some ground is sacred, that the truth cannot be changed nor doctored—and sacred ground is not monopolised by Indigenous people; truth is not a race-specific thing, we all have our own story we are trying to express, the place we are coming from or trying to get back to, the point we are trying to make. If dramaturgs try to force their interpretation of the truth then those are the stories they need to write themselves. Kamarra Bell-Wykes is a descendant of the Jagera and Butchulla clan groups. Her plays include Shrunken Iris (Next Wave and Ilbijerri); Chopped Liver, which toured for four years visiting schools, prisons and Aboriginal communities from Broome to Cherbourg; Body Amour, (Ilbijerri 2012); and Mother’s Tongue (Yirra Yaakin, 2010). Kamarra recently participated in the Black Comedy creative development process for ABC2. She loves to explore modern day issues facing contemporary Aboriginal people.